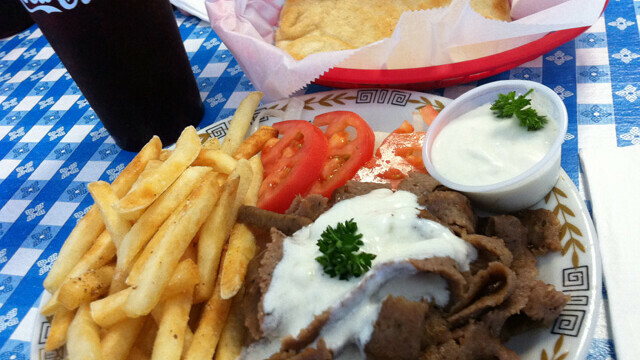 Eau Claire's longest-standing gyro joint, The Olympic Flame offers a number of traditional Greek dishes alongside the trademark savory, pita-based sandwich. The bar is a bit of a local hangout and a great place to relax. Vegan and kid-friendly options. Closed Saturdays and Sundays. Call ahead for large groups. Olympic Flame isn't your typical drinking spot. It's a restaurant that happens to have a physical bar where you can eat your Greek cuisine and enjoy popular items like Mythos (a Greek beer) and ouzo (a Greek liqueur that tastes like black licorice). They also mix standard drinks.